Our mission at Golf Club Brokers is to help you turn your golf clubs into cash while eliminating the hassles and risks associated with selling your clubs on your own. Golf Club Brokers strives to offer the highest trade in value possible for your golf clubs. See our price matching policy for more information on this. We will do our best to make sure that you are happy, so please let us know if you find any of our services to be unsatisfactory. Golf Club Brokers is 100% safe and risk free with no gimmicks or hidden fees. Our passion for golf and extensive knowledge of equipment enables us to provide competive offers with a streamlined process. We will strive to give you the highest possible cash offer and get you paid quickly. If PayPal payment is selected, we will pay you within 24 hours of receiving your club and if you choose to receive a company check we will send it out within 24 hours of receiving your club. Many of our competitors are offering store credit to force you to buy your new clubs from them. Golf Club Brokers on the other hand will offer you cash for your used golf clubs and allow you to go wherever you want to purchase your next set of clubs. We also offer free shipping on any quotes over $100. Get started now to find out the trade in value of your golf clubs by choosing a club from the menu. While we strive to offer the highest cash amount possible, we realize that there will be times when our competitors will offer more. When this scenario happens, we will do our best to match that offer to win your business. We know that it would be much easier for you to sell all your clubs to one company instead having to shop around and ship your clubs to different companies. In order to receive a price match, please contact us where the higher offer is located along with the club information. Unfortunately, we are unable to match prices on left handed clubs. The offer of our competitor must be a cash offer and not a store credit or gift card. We must be able to verify that it is a reputable business. The club in question must match the club selected on our website exactly. You must include a link to the website and the item you are requesting the price match for in the email. Golf Club Brokers pays for your shipping on quotes over $100. You will receive the complimentary pre-paid shipping label via e-mail after accepting your quote. All customers receive access to print a pre-filled address label after confirming your quote. If you have difficulty printing an address label you can make your own address label, using the address below. If you make your own label be sure to include your quote number (Cxxxxx) on the outside of your box for identification purposes. Be sure to adequately package your item(s) to insure a safe arrival during transit. Use plenty of bubble wrap and a sturdy box for packing. Please include a copy of the packing slip with your signature inside the box (accessible when you accept a quote). When your package arrives at Golf Club Brokers, you will receive a confirmation e-mail within 24 hours (excludes weekends and holidays). Why wait? Some trade-in companies can take up to two weeks to send out your payment. We guarantee that your check will be sent out within 24 hours (excluding weekends and holidays) of receiving your golf equipment. Below is a list of options you can choose from when confirming and accepting your quote. Your payment is processed via company check and sent out via First Class Mail. Your payment is sent out within 24 hours of receiving your package (excludes weekends and holidays). Delivery via First Class Mail typically requires 2-7 business days. Your payment is processed via company check and sent out via UPS Next Day Air. Your payment is sent out within 24 hours of receiving your package (excludes weekends and holidays). Delivery via UPS Next Day Air requires 1 business day for delivery. 1Unless your quote is over $500, the cost to ship the check to you will be deducted from your check total (about $30-$40 for most destinations). We'll send you a tracking number so you can track the progress of delivery. Your payment is processed via PayPal (www.paypal.com). 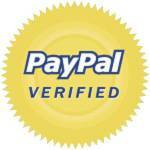 PayPal is an online virtual bank account that enables you to easily receive money, instantly. Your payment is sent out within 24 hours of receiving your package (excludes weekends and holidays). Delivery via PayPal is instant. Club has never hit a ball and is brand new. Must include all accessories such as head covers, weight kits, tools, etc or it will be placed in the 'Good' category. If it has been hit even one time, it will be placed in the 'Good' category. Shop worn products will be placed in the 'Good' category. Club shows signs of wear from normal use, but has not been abused. The club is in good working condition with no sky marks, dents, or rattles. Grips should be in playable condition or the offer may be lowered. Club shows signs of heavy use including gouges, scratches, and chips in paint. Shafts may be scratched and grips may be worn, but the club is still in good working order. The grooves on irons should be in good shape.